This Chocolate Irish Cream Bread Pudding recipe is a tasty twist on a comfort food classic! 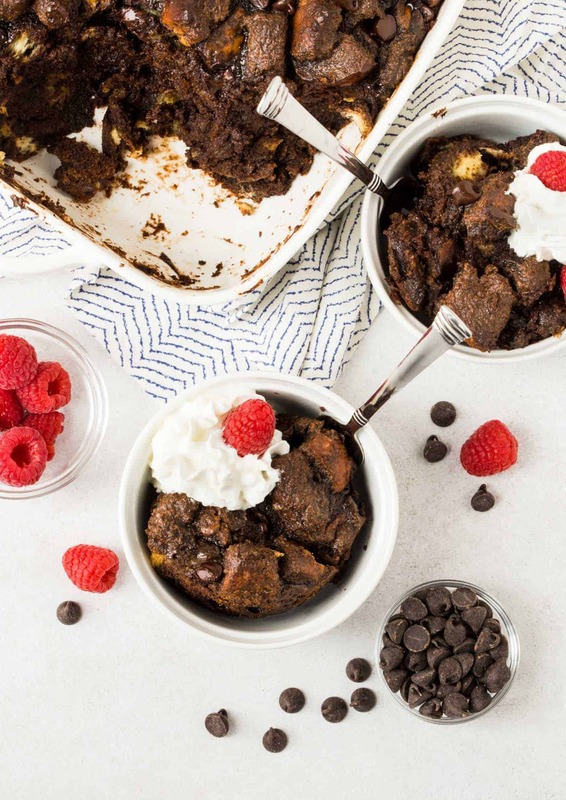 If a homemade dessert says “love”, then this Chocolate Irish Cream Bread Pudding recipe screams complete and utter adoration! 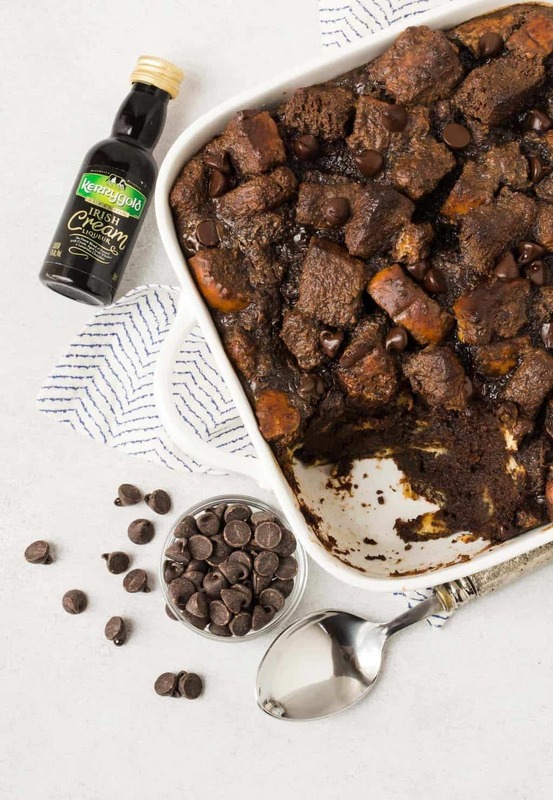 Bread pudding is a classic comfort food dessert on its own, but amp up the flavor with chocolate and rich Kerrygold Irish Cream Liqueur, and you have a decadent spin that is perfect for Valentine’s Day – or really any day worthy of celebration. Admittedly, I used a heavy hand in adding the Irish Cream Liqueur to the recipe, so be prepared for a boozy bite. But after several attempts to balance the chocolate to liqueur ratio, I finally landed on one that is decidely chocolate but still allows the gorgeous flavor of the liqueur to shine through. This Chocolate Irish Cream Bread Pudding is ideal for entertaining because you can prep all the ingredients ahead of time and then simply let the bread cubes soak when guests arrive. You can scale this recipe and make it in ramekins for a few folks or keep the recipe whole and serve it to a larger group. (Ramekins will bake through anywhere from 25-35 minutes.) Pop it in the oven while you are eating and let the aroma of chocolatey goodness entice you to save room for dessert. This Chocolate Irish Cream Bread Pudding is flavorful enough to stand on its own, so I opted to top it with a simple whoosh of whipped cream and a few raspberries. But if you’re craving even more richness, you could also add a drizzle of hot fudge spiked with a bit of Kerrygold Irish Cream Liqueur on top of each serving. Tip: If you love deep chocolate flavor like me, take the time to seek out dark chocolate and dark cocoa for this recipe. It’s a great complement to the flavor of the Irish Cream Liqueur. Looking for more boozy bread pudding inspiration? Check these beauties below! Place bread cubes on baking sheets and bake for 8 minutes or until toasted. Place bread cubes in a large bowl. Place ½ cup chocolate chips, cocoa powder, sugar and 1 cup half and half in a saucepan. Heat over medium heat, stirring until chips are melted. Set aside to cool slightly. Stir together remaining ¾ cup half and half, Irish Cream Liqueur, eggs, vanilla and salt in a large bowl. Slowly pour cooled chocolate mixture into liqueur mixture, whisking to combine. Pour liquid over bread cubes, stirring to ensure all pieces are evenly coated. Allow bread to sit for 30 minutes to absorb the liquid. Spoon soaked bread cubes into dish and top with remaining ¼ cup chocolate chips. Bake for 40-50 minutes (the shorter amount of time for shallow baking dishes, the longer baking time for deeper dishes). Let rest for at least 20 minutes. Serve warm with whipped cream and fresh raspberries. Irish cream and chocolate are one of my favorite combinations! This looks decadent and delicious!